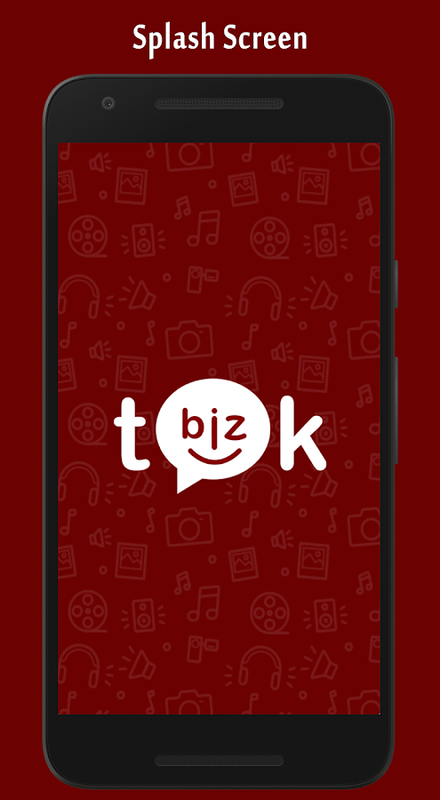 TokBiz Messenger is a FREE messaging app Currently available forAndroid Only. TokBiz uses your phone's Internet connection(4G/3G/2G/EDGE or Wi-Fi, as available) to let you message friendsand family. Switch from SMS to TokBiz to send and receive messages,photos, videos, documents, and Voice Messages. WHY USE TokBiz: • NOFEES: TokBiz uses your phone's Internet connection (4G/3G/2G/EDGEor Wi-Fi, as available) to let you message friends and family, soyou don't have to pay for every message. * There are no subscriptionfees to use TokBiz. • MULTIMEDIA: Send and receive photos, videos,documents, and Voice Messages. • GROUP CHAT: Enjoy group chats withyour contacts so you can easily stay in touch with your friends orfamily. • NO INTERNATIONAL CHARGES: There's no extra charge to sendTokBiz messages internationally. Chat with your friends around theworld and avoid international SMS charges. * • SAY NO TO USERNAMESAND PINS: Why bother having to remember yet another username orPIN? TokBiz works with your phone number, just like SMS, andintegrates seamlessly with your phone's existing address book. •ALWAYS LOGGED IN: With TokBiz, you're always logged in so you don'tmiss messages. No more confusion about whether you're logged in orlogged out. • QUICKLY CONNECT WITH YOUR CONTACTS: Your address bookis used to quickly and easily connect you with your contacts whohave TokBiz so there's no need to add hard-to-remember usernames. •OFFLINE MESSAGES: Even if you miss your notifications or turn offyour phone, TokBiz will save your recent messages until the nexttime you use the app. • OFFLINE SMS: If your internet is off, andif someone send message you receive SMS in your SMS inbox. • ANDMUCH MORE: Share your location, exchange contacts, set customwallpapers and notification sounds, and more! *Data charges mayapply. Contact your provider for details. "Hi Chat - Messenger & Social Apps All in One" is one of thebest and the most comprehensive social messenger app in the store!Download Hi Chat now and reach all popular messenger apps andsocial media app s from only one app everytime you want ! Hi Chatmakes you connect to your all POPULAR social messenger apps withonly one touch.Hi Chat will help all users open their popularmessenger & Social Media applications, such as:Messengers:WhatsApp, Facebook Messenger, Viber, KakaoTalk, Wechat, Line,Tango, Hangouts, Snapchat, Telegram and othersSocial Media Apps:Facebook Lite, Twitter, LinkedIn, Quora , GMAIL, VK, Vimeo,Pinterest etcWith Hi Chat, you have access to a world of chat andcommunication.FEATURES:- Simple chart showing messenger app use-Fast access with just 1 clik- Messenger cooperates with more than100 messenger apps- Open more than 500 messenger and social mediawebsite that you didn’t install by one tag"Hi Chat - Messenger& Social Apps All in One" also shows you your usage statisticsof major messenger and social media applications like FacebookMessenger, Tango, Pinterest, WeChat, Kik, IMO, Xfinity, Telegram,Whatsapp and many moreCreate your connection between all world ofchat and communication with one touch, NOW! Join the next generation of augmented reality 3d social messagingapp and merge your imagination with reality. Dream and exploreanything anywhere through your personalized 3d avatar (TaDa). 3Davatar creator feature helps you to make your own look-alike 3davatar (TaDa). Rock out on stage with your favorite band and shareyour video with TaDa to your social media pages. Climb the EiffelTower and shout out your love for your sweetheart throughpersonalized 3d avatar with voice recording feature. Connect withfriend’s avatars around the world without ever leaving your bedroomthrough your live feed. Are you an introvert, hesitate to face thecrowd, unable to express yourself, haven’t explored yourself yet,feeling lonely, want some fun with friends or want to increasesyour creative thinking? Then TaDa Time is the perfect app for you.Share your feeling, dance anywhere using your 3D Avatar, act withit or experience anything you want to, chat using 3d AugmentedReality - AR emoji’s of your own with friends or in a group. Whenit’s TaDa Time, Quickly find relevant 3D avatar animations withoutleaving your chat. TADA TIME follows you wherever you go and shareeverywhere as Animated 3D avatar. It’s a 3D Avatar creator app,where you can experience anything without being actually physicallypresent there. Its Augmented Reality (AR) makes the real-lifeenvironment around you into a digital interface by putting your 3DAvatar in real-time. AR Messenger: Combines traditional text chatsalong with augmented reality. Send messages of a virtual you, sothat your friends and family can hold you in their hands. TaDaTime’s messenger feature makes augmented reality chat real. Createyour own 3D Avatar and communicate with anyone using AugmentedReality - AR chat features. More ways to communicate: Create songand music acts by dubbing and share to your network and communityor discover songs and music for your act from mirror option in thevideo feed. Group Chats: Socialise and connect with friends andfamily via video and text. TaDa Time is a social messenger whichconverge all the features of a messenger in a more realistic andfun way. Social Media: ✔ Compile, create and exchange excitingaugmented reality messages to your social networks. ✔ Through TaDaTime’s feed, you can now be a part of the Augmented Reality worldand see what your friends are doing with their 3d avatar. ✔ Shareyour location, contact details, pictures with your friends andfamily. ✔ Mirror interesting acts with dubbed voices. Get popularmusic and sounds with acts using mirror options from the feed.Features of TaDa Time: Personalise: 3d avatar creator gives you anoption to customize your hair, clothes, and accessories. Acts:Dance, flirt, laugh, sports, love, sing and much more. Sendgreetings for any occasion. Voice recording: Personalise youravatar messages in the real world with your own voice or music.Chat: Record your digital you in real world, share and chat withyour friends. Feed: Post your creations to your network andcommunity discover others post and socialize with friends andfamilies. What do you need to operate the app smoothly: Ideally anAndroid phones that have more than 2 GB RAM and Gyro along with thelatest Android version with a high camera quality. Thepossibilities are endless. It’s TaDa Time! In today's world, it is tough to stay in touch with our near anddear ones. With busy schedules and staying in different cities orstates the distance has increased even more. But all thanks tovarious social media apps and messaging portals, we can now easilykeep in touch with our buddies and family in a single click. Zulka,one of the best messaging app gives you rewards for sendingmessages and playing games. You can use various social mediaplatforms through Zulka to chat with your close ones and earnrewards * Win a ticket every time you send a message * There aremany weekly and monthly lucky draw competitions in which the moretickets you earn, the more your chances of winning * Many peoplehave received Rs. 50000 in the lucky draw competition * With ournew and improved messaging app and 13 privacy control options, yourchats and conversations are as safe as under lock and key * Did youknow we have now included Scratch cards in our app? Well, the moretickets you earn, you win scratch cards that have prizes like atrip to Goa, cash prizes and prize draw tickets * Enjoy games? Playand win exciting cash prizes, and other rewards * Lifestyle segmentgives you the chance to be in trend and follow the right stylestatement. Be fashionable and rich with Zulka! You can chat, call,refer your friends and help them win prizes to celebrate together.The primary motive for us is to bring people together and cherishcloseness and friendship. Planning for a trip? Want to give yourclose one a gift? Not to worry, download Zulka and send text orchat unlimited to earn tickets and your dream vacation or gift isjust a step away. Privacy is our motto, and we do not wish tocompromise on any of our customer's details and hence, we haveamazing privacy settings as well. Planning a trip to Goa cannot beeasy with all the shopping, the necessary items and places to visitall have to be perfect right? Do not worry! We also have alifestyle section that helps you learn all about new and upcomingstyles, places and best the food to taste. What do you need toknow? Simple chat and win. It's that easy! We agree that socialmedia is not just for chatting and calling, but also other excitingstuff like 'Games', and we have introduced a few amazing games yourway. Don't feel disappointed in thinking you cannot participate inthe lucky draw. Of course, you can! All our app users are equallyimportant and no matter you use it for games, lifestyle or chattingand calling everyone is eligible to win rewards, scratch cards, andcash prizes! No more waiting to enjoy life’s treat. Chat or callwith Zulka and you are on your way to your dream destination.Hurry! Download the Zulka app now and enjoy the company of friendsalong with the comforts and benefits of our app. Clonapp Messenger is the best free app to open your personalWhatsApp account on different devices or Tablets.Key Features:----------------------- Dual WhatsApp account on same / differentphone / tablet- Clonapp Messenger is Fully secure- Scan the QR Codefrom WhatsApp Web and load instantly- Open same account on multiplephones /tablets- Double whats up, double the fun!- You can havedual WhatsApp in 1 device!FeaturesAvailable:------------------------------✓ Send / receive message✓Read chat history✓ Receive photos and videos✓ Download and watchphotos and videos✓ Receive audio messages✓ Forward media✓ Sharecontacts✓ Search chats and contacts✓ Receive documents Remark:Clonapp Messenger is made by us and not related or belong toWhatsApp inc.
Zangi Private Messenger is a serverless messaging app to makeuninterrupted voice and video calls, fast and private messaging,file sharing, which works from anywhere, anytime, and mostimportantly, it is absolutely free to download and use. Why UseZangi Private Messenger? • Keep your communication safe and awayfrom any servers • Make high-quality voice and video calls evenwith 2G internet • Spend up to 6x less mobile data than othermessaging apps Mastery Approach to Security Zangi implements thelatest and greatest security technologies to protect you fromprivacy risks. • No Third Party Access All communication is securedwith end-to-end encryption —eliminating “middleman” listening. • NoServers. No Clouds. No Big Data. We have refused to collect bigdata and we don’t keep any user data on any servers. • No PersonalInfo Leaks. Your private communication, personal info, and historyis encrypted locally and stored only on your device. • No Fear.Your data and conversations only belong to you and are seen by youand your intended recipient. Zangi-Built New-Age TechnologiesZangi’s in-house developed technologies provide revolutionaryresults in real-time communication. • Uninterrupted Calls & HDQuality Always stay connected. Have clean, HD quality audio andvideo calls. • Internet Speed Doesn’t Matter Never worry aboutcrowded Wifi or slow internet. Zangi adapts to your internet.Connect anywhere, even with 2G/ EDGE, noisy Wi-Fi and Satellitenetworks. • Low Data Usage Save money. Consume 6X less data thanyou would with other messengers. • Fastest Messaging Send instantmessages, photos, videos, and any files. Zangi is FREE and alwayswill be Zangi to Zangi communication is always FREE. Zangi does notsell ads and will never introduce supplementary fees at any point.Original Stickers and Funny GIFs It’s refreshing to download amessenger that offers a whole new collection of originally designedstickers. Express yourself with Zangi’s colorful, themed stickers.Bring your text to life and give the best reactions with GIFs.Private Group Chats With an encrypted messenger, enjoy privategroup chats with your team members, family or friends, and neverworry that your communication can be leaked or hacked. Reply orforward specific messages in the group chat. Personalize the groupwith a group image, name, background and more. Download ZangiMessenger for Free today, for a messenger experience that providestotal privacy and quality communication. Zangi Private MessengerDownload Now - Connect and Chat!